Raised in an Iraqi family of educators, the importance of independent thinking was instilled in Malak from childhood. Her father was a university professor and her mother was a civil engineer. They taught Malak, her older brother, and her younger sister to dream big, work hard, persevere, and excel even in the face of adversity. They taught their children that education is the best asset to broaden their horizons for a better life. 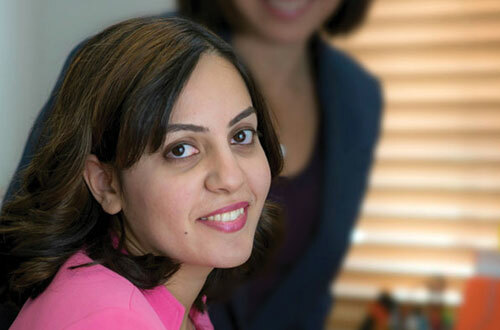 When Malak entered the University of Technology, Baghdad in 2004, she was a teenager with bright eyes and a focused mind. Unfortunately, the country was at war and even Baghdad, Malak’s home and the cradle of civilization, was no longer safe. Despite the concern for her safety as she traveled to and from the university, she continued to attend her classes every day and graduated in 2008 with Bachelor’s degree in Computer Science. Only 10% of Malak’s original class completed the degree, the rest had either dropped out or disappeared for a list of reasons. She arrived in California in 2013. She remembers being overwhelmed with emotions after leaving the only home she had ever known, and starting a new life in a foreign land. The only good part was that she had met her Mr. Right and they had gotten engaged soon after her arrival in the US. The wedding took place in 2014 and she moved with him and his family to Boise Idaho. Malak says, however, that her life in the U.S. starts only after she moved to Boise with her husband and his family. Her first memory of getting oriented was in May of 2014 when she joined Global Talent Idaho to reclaim her career in Idaho. “They did a lot for us … all of them… Tara, Lisa, Gina,… helped us write our resume, cover letter, taught us how to network, market yourself … very personal, one-on- one coaching tailored to my background and current situation … unique and very supportive”. She recalls career summits conducted by GTI and says that she still benefits from the GTI Career Summit she attended and the feedback she received during the mock interviews and networking.